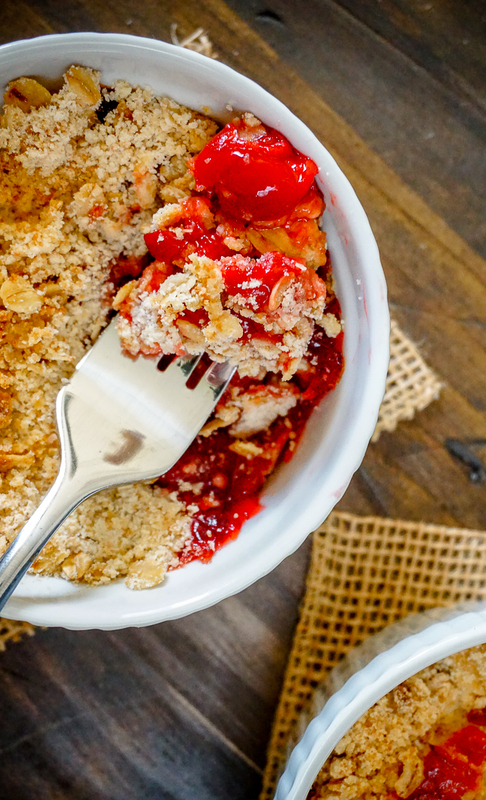 At home date nights deserve a delicious Cherry Crisp for Two dessert recipe! We avoid going out to restaurants on Valentine’s Day. For one, it isn’t a big holiday in this house. 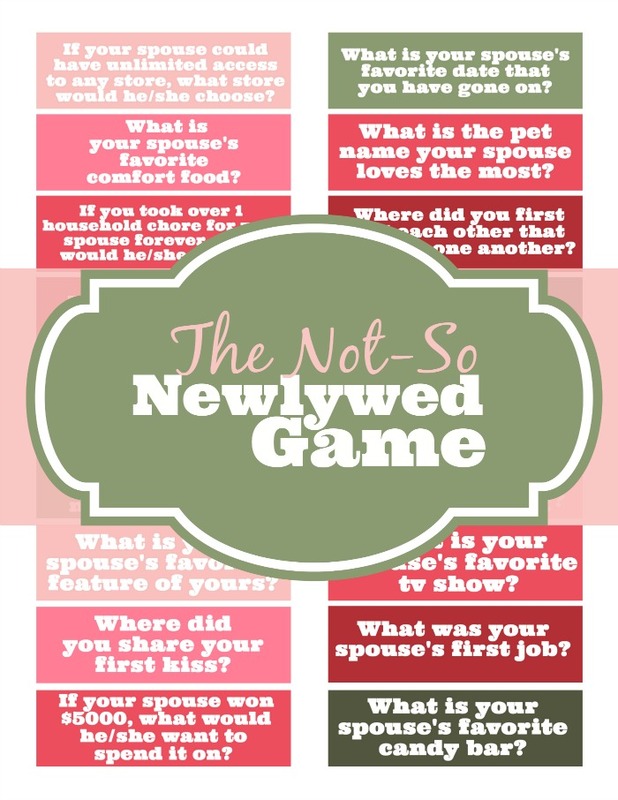 We use it as an excuse for a fun date night, but we don’t exchange gifts or anything like that. 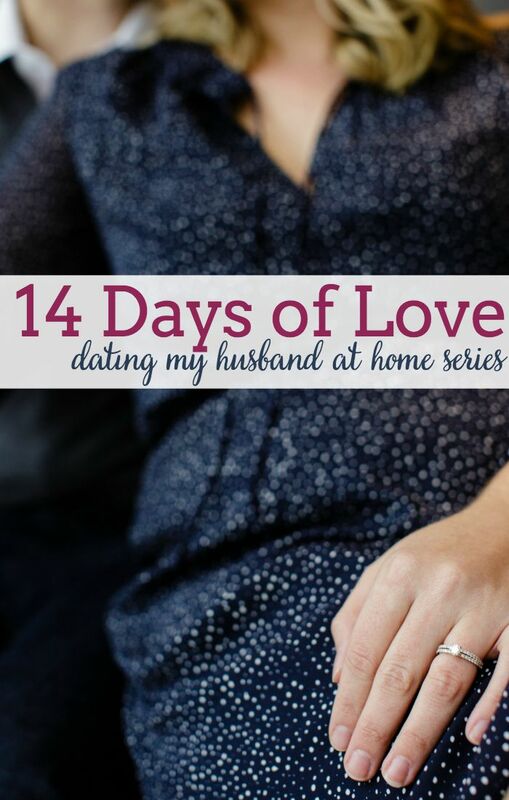 Two, over crowded restaurants don’t exactly say romance. It’s still just us, so a nice dinner at home is our go to. 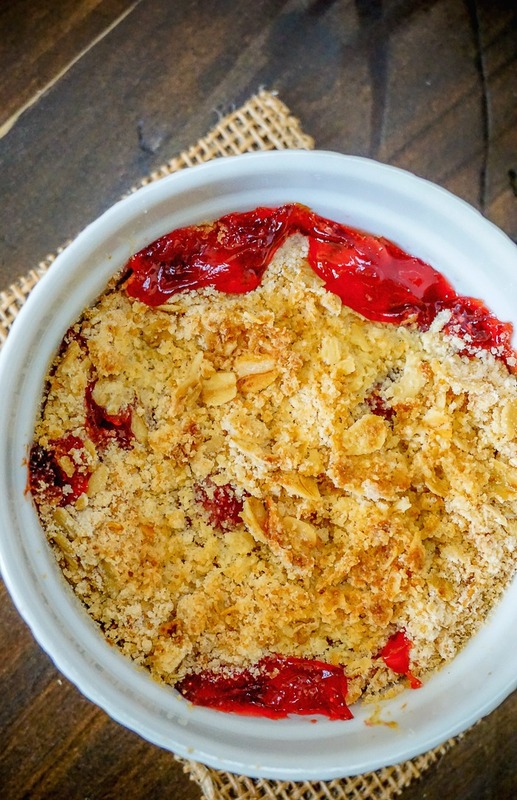 Since Bryan loves cherry recipes, I thought a quick Cherry Crisp would be perfect. It is red after all! The best thing about this recipe is it really is quick to put together. 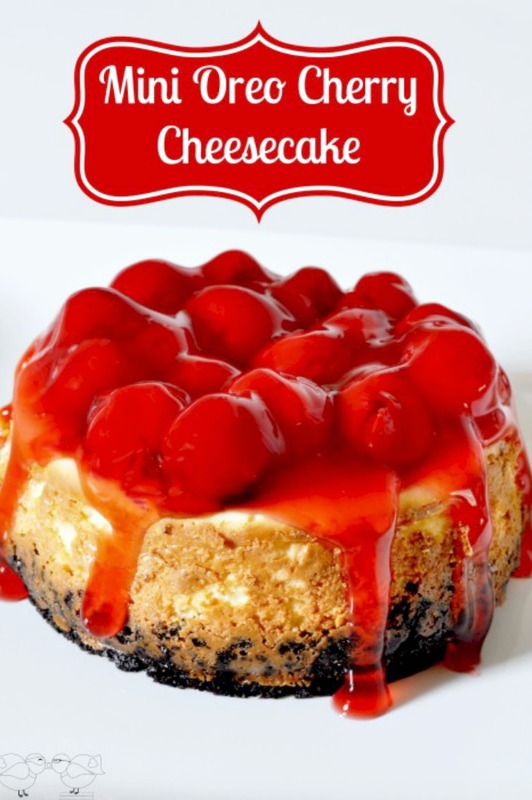 Quickly toss the cherries with a couple ingredients and quickly toss the dry ingredients together, and that really is all the prep you need to do. Since cherries aren’t in season right now, I used canned, and it still tasted delicious! 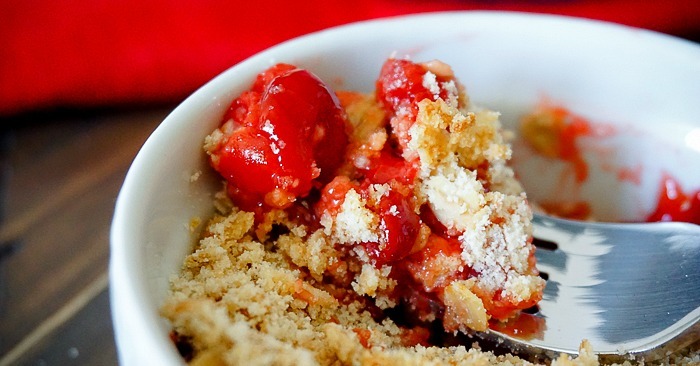 in a small bowl, mix together the cherry filling. In a medium bowl, mix together your dried ingredients for the crisp topping. Add in the softened butter. Using your fingers, pinch the flour/sugar mixture into the butter until large crumbs form. 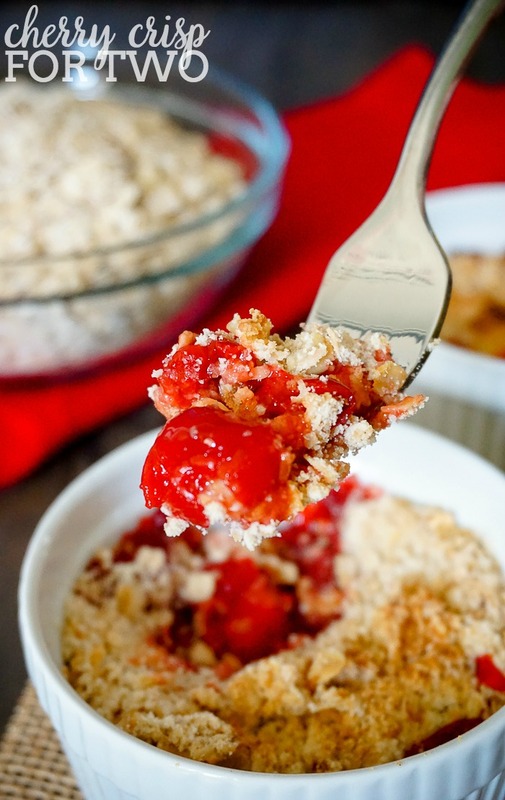 Add a little bit of the crisp topping into the bottom, then add the cherry filling, and finally top with the rest of your desired amount of crisp topping. I love quick little recipes like this! And I’m with you, I always make a treat and then we’re munching on it for days!